Highland distillery Glenturret is to celebrate the 44-year career of cooper Michael Jamieson with the release tomorrow of a 29-year-old single cask single malt. Only 170 bottles of Glenturret Jamieson’s Jigger Edition, a cask strength whisky bottled at 43.1% abv and priced at £295-395, will be available from Wednesday, 8 March. 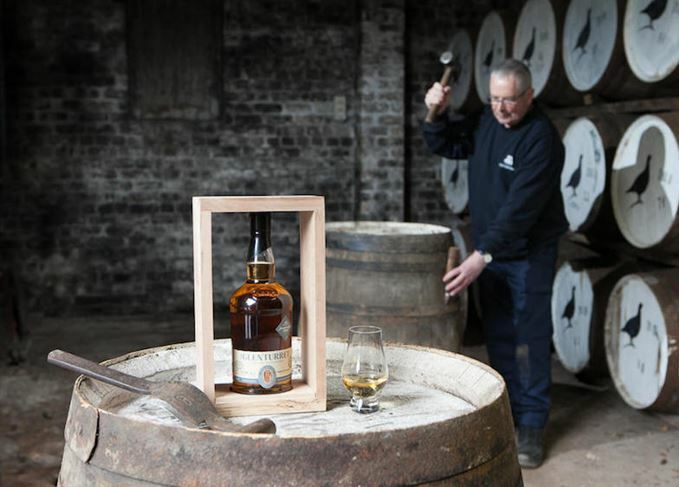 The whisky was filled into cask on 20 November 1987, using a repaired cask that would have once passed through the Clyde Cooperage in Addiewell, where Michael Jamieson spent his career. Jamieson – a cooper like his father before him – started working at Clyde Cooperage in 1971 at the age of 15, and was involved in the repair of thousands of casks a year. He also had a hand in making the wooden washbacks for distilleries across Scotland, including the Douglas fir washbacks used at Glenturret. Jamieson has since retired and now lives in Speyside, ending his career with seven years as a foreman cooper, responsible for moving 40,000 Sherry casks from Spain and 90,000 refill casks. Jamieson – the latest in a succession of people to have a Glenturret bottling dedicated to them – was presented with bottle number 002 of Glenturret Jamieson’s Jigger Edition. Under new owner Lalique, the team at the Perthshire distillery has a familiar look. The distillery cat is the latest ‘famous’ face honoured with a ‘Bottle Your Own’ cask. A battered snapshot brought from Canada sheds light on a century-old family story.